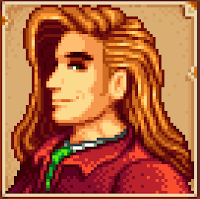 Perhaps the most dashing dude in all of Stardew Valley, Elliott looks like he belongs on the cover of a romance novel. An apt choice, too, as he's the creative type himself - though his seclusion down on the beach, a little removed from the rest of the community, hints at some frustration with his work. Dat hair, though. Dat hair. Elliott is an aspiring novelist who lives on Stardew Valley's beachfront. He spends most of his days working on his craft in his Cabin, staring out at the sea, and spending time with Leah in Stardust Saloon. He's one of the more difficult villagers to pin down at first, as you won't find him wandering deep into town too often, and his schedule is a bit erratic throughout the week. Elliott's birthday is on the fifth of Fall. Despite his humble living quarters Elliott has some rather upscale tastes, and tends to like sea-based recipes such as Crab Cakes and Sashimi. Most fish, particularly shellfish like Crabs and Lobsters, tend to go over well. Fruit also gets a good reception, and anything grown on trees should be welcomed by Elliott. He also likes gemstones, and you'll get a good response from Diamonds, Rubies, Emeralds, Amethysts, and so on. Elliott isn't that interested in greens - he has a bit of a sweet tooth, apparently - and stuff grown on your farm will meet with disinterest. He also doesn't seem to like junk food very much, so Pizzas and Joja Colas probably get trashed by Elliott shortly after you walk away. During the Spring he stays on the beach and docks a fair bit, though if he's not there you can usually find him to the west, near Leah's Cottage. He really likes looking at the water. On rare occasions you can find him sitting in the Saloon with Leah, though he doesn't seem to stay there for long, and very occasionally you can find him walking to Pierre's General Store during the day (11 am-ish). Elliott's schedule doesn't change a whole lot in the Summer, though he's more likely to stand near the campfire than to sit by the beach. In Fall Elliott will begin visiting the Library during the day, spending a few hours there on most days before heading home again. Elliott continues to visit the Library regularly in Winter. He also seems to spend more time in the Saloon during this season. If you're having trouble finding Elliott on any given day your best bet is to skim along the southern end of Pelican Town. I've never seen him go any further north than Pierre's General Store. Befriending him early is recommended, as you can't follow him into his Cabin until you're friends. At two hearts you can trigger a cut scene by entering Elliott's house while he's there. He'll ask about your literary tastes. At four hearts you can trigger a scene in the Stardust Saloon with Elliott. Check in the evening, once everyone has congregated at the restaurant after work. At six hearts you can trigger a scene in Elliott's house during the day. Piano! At ten hearts you'll get a letter from Elliott, asking you to meet him down at the beach when it's sunny. Head there in the morning (after 10 am) and you'll get a cut scene with Elliott. Accept his smooch and you can move ahead with buying a Mermaid's Pendant, allowing the two of you to get married.